This was a fun and easy workshop that I did with adults, but it’s one that older children and teens would love as well! Inspiration came from this picture on Pinterest…. 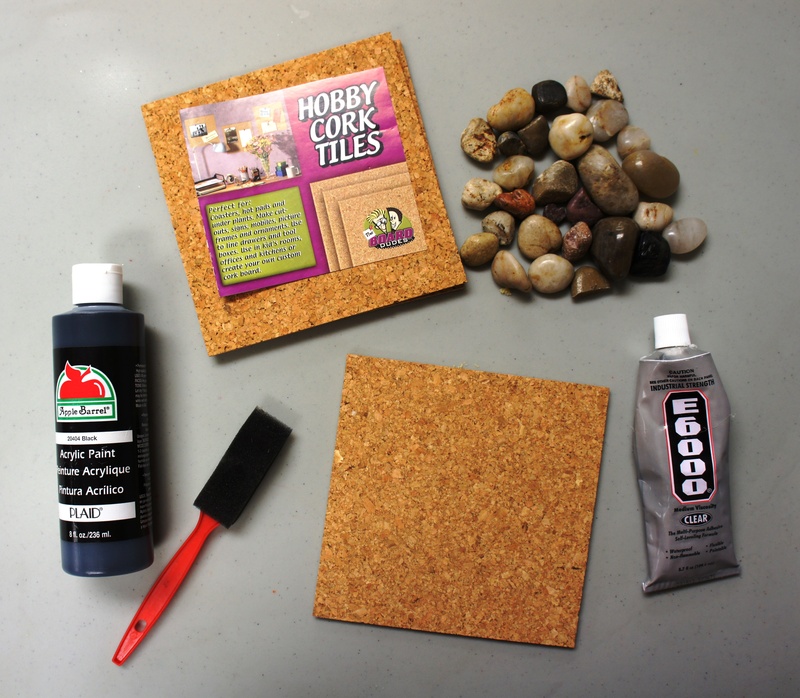 Cork board – You’ll want the thicker (~3/8 inch thick) cork board to be able to hold all of the rocks. Thin cork board or felt will make for wobbly trivets. I used 6 x 6 inch cork tiles. 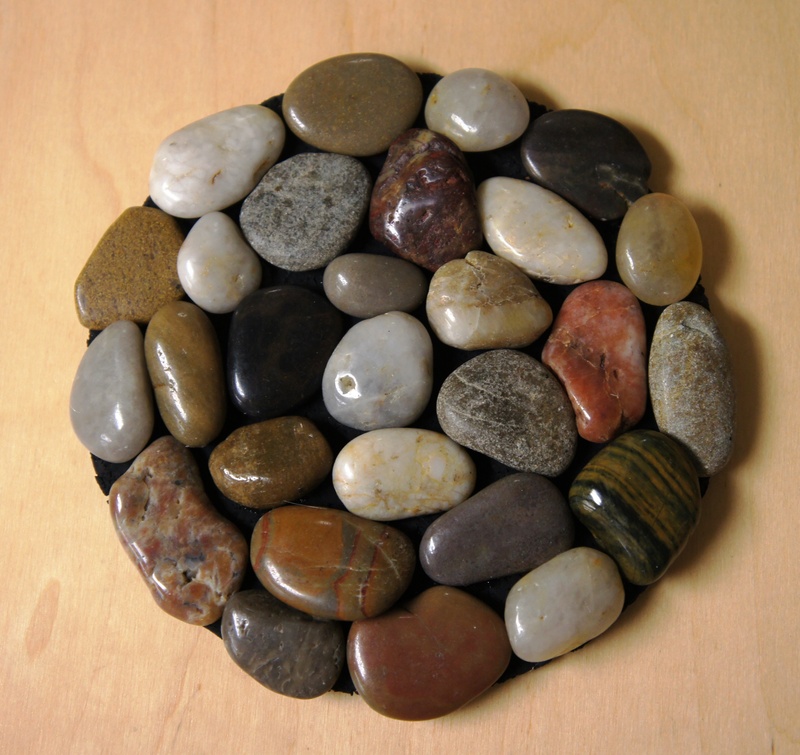 River rocks – I had the most difficult time finding these! I originally purchased a bag at the dollar store, but they weren’t polished and shiny. I eventually found some at Target that I liked (they were sold as ‘vase filler’). I found that a 5 lb container made 8 trivets. I traced a circle onto my cork board and then cut it out with scissors. For the workshop, I had several circle templates cut from paper for everyone to trace. I used a foam brush and painted a light coat of black paint on the top and sides only. You will not want to the paint the bottom because it will rub off on surfaces when used! The paint dries pretty quickly, but you can wave the cork board around or blow on it to get it to dry faster. 🙂 During the workshop, we took a short break to wash hands, eat some banana bread, and chat while the paint dried. This is embarrassing to admit, but on my first attempt I glued the rocks on with hot glue. Well guess what happens when you use it as a trivet for something hot? …..yeah, the glue melts. E6000 glue works perfectly! And it is permanent once dry! It is quite smelly however. You just might want to take that into consideration and try to use it in a room with ventilation. 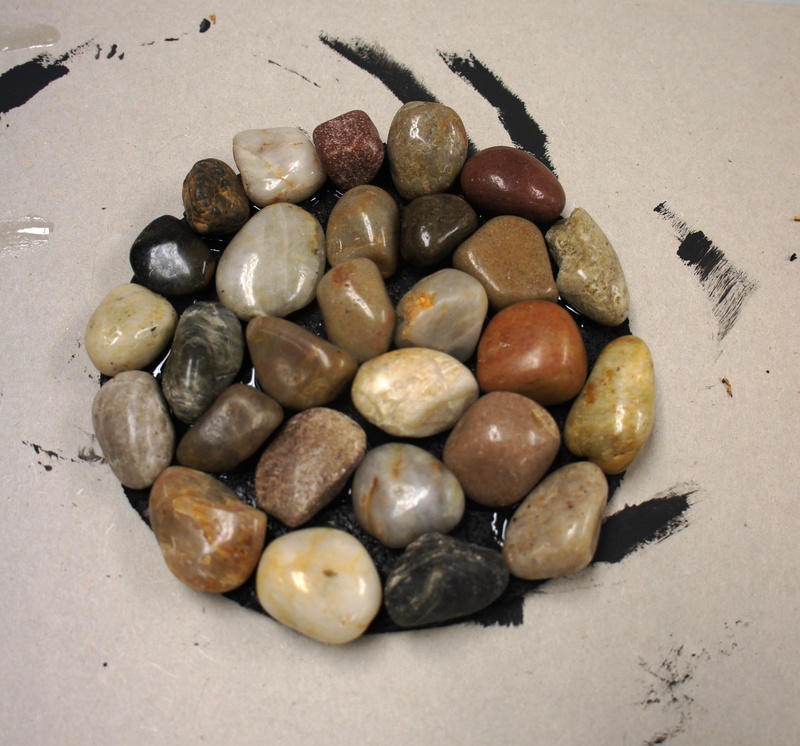 I suggest doing a “dry run” with the rocks before actually gluing them on. Get them set out how you want them and then glue each one on individually. 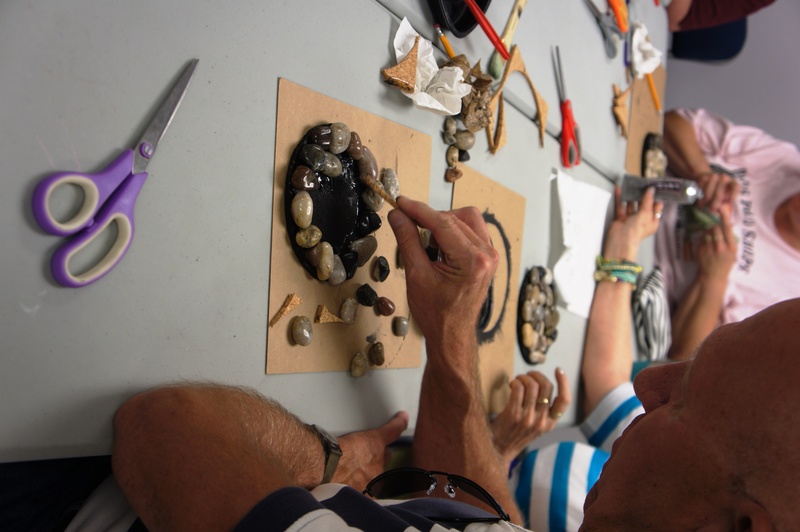 Keep the height of the rocks in mind – you want your final product to be fairly level so that you can set something on it. It works well to have a piece of cardboard to set on top of your trivet to see if it’s level before permanently gluing the rocks down. Step Five: Step back and admire! The glue will need a chance to dry and set, but once it’s dry you’ve got yourself a cool little trivet! I love how each one is unique! 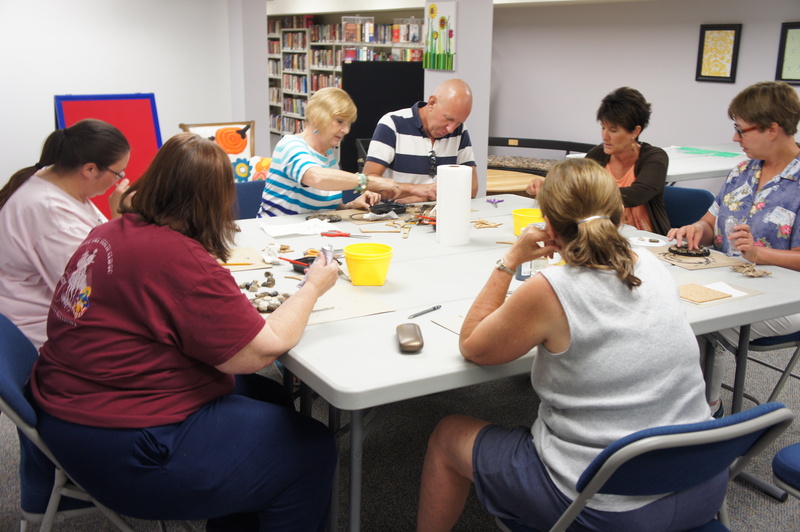 June 26, 2013 in Arts & Crafts, School Age Programs. Thanks for sharing! 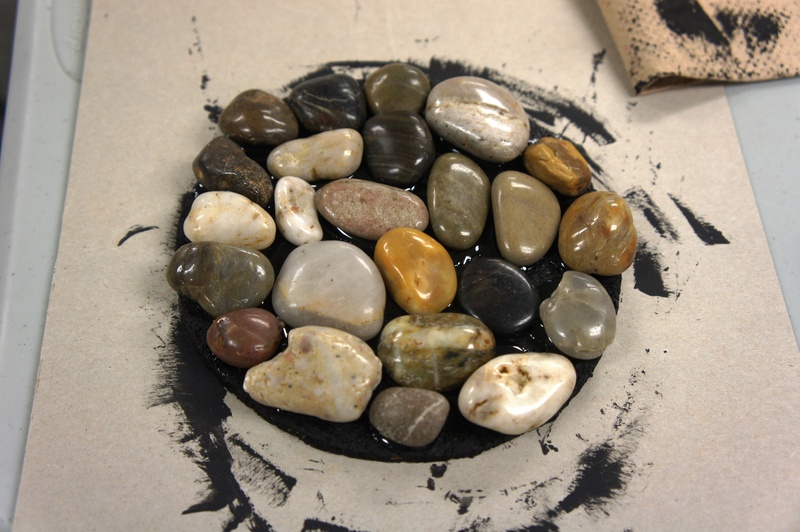 I just made a few both circular and square and used a combination medium and small river rock. I can’t wait until they are dry to get the full effect. As a homeschooling mom and daycare/preschool teacher I am excited to explore the rest of your blog. This would be pretty with those glass half marbles that are used for vase filler. Do you think they could withstand heat? I was thinking the same thing but I’m afraid the fast temperature change would cause them to crack. I was wondering if you had tried it with smaller river rocks. I was considering making 1-2 coaster size to give with spice tea I am making for Christmas. Do you think that would work? I haven’t tried it, but I definitely think it would work. Great idea! Instead of cork could you use a saucer or piece of pretty glass? I’m sure that would look very nice! I used cork so that it would absorb heat and protect the surface that it sits on. These sound wonderful to make but I am not used to making crafts and would like to know the purpose if the paint. Is it for decirative purposes or to be used as a cork sealant to smooth it out? Also, what kind of paint should I use? The paint is purely decorative. I made one without paint first and the rocks just blended in with the color of the cork. It looked unfinished. The paint I used was basic acrylic paint. In my post, I have a link to the exact paint that I purchased from Amazon in the list of materials, but you can buy acrylic paint at any craft store. Thank you for your quick response! I would like to apologize for the typos in my post. I pressed send before checking what I wrote. The trivets I made look really good. I’m not that great at crafts though. I used a glue gun and the glue sticks that go with it. Will that glue hold the rocks? My rocks were picked up at a river so they’re not shiny. Is there a shellac or something that should be used too to hold the rocks on better and make them look shiny? I didn’t find that a glue gun held the rocks very well once the trivet got hot (from a hot item being placed on it.) I found that the E6000 glue (that I mention in the post above) worked best. If you use your trivets for more decorative purposes, I’m sure that the glue gun will work just fine! I didn’t spray a coating on mine, but if you are looking for a clear coat, you could try Dupli Color Premium Enamel http://duplicolor.com/product/premium-enamel It is heat rated to 500F. Best of luck!